One of the last weddings for our 2016 wedding season was in Ottawa! Yes, we do travel to Ottawa to DJ your wedding! Chelsea and Mark chose the Cedarhill Golf and Country Club for their outdoor ceremony and reception. The venue was very nice, fantastic for outdoors photos, and the staff was excellent too! The afternoon started outside, under the tent for a beautiful wedding ceremony that UPX provided sound for. Cocktails were then served inside and outside, followed by the reception in the hall. Have a look at the vLog to see how much fun we had that night! 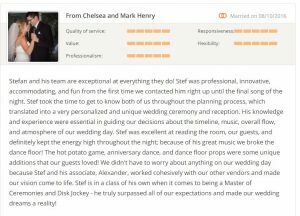 UPX provided fully personalized introductions and a Love Story for Chelsea and Mark’s first dance, it was an amazing wedding in Ottawa! Here is the Wedding Wire review they left us too! If you are looking for a wedding DJ in Ottawa that can create a truly unique reception and the best wedding ever – before the party even starts – Uptown Xpress is your number one choice for an unforgettable wedding entertainment experience. Stefan Jez is one of the most popular wedding MC’s and DJ’s in Montreal and will travel to Ottawa, contact Stefan at 514-297-3508 or stefan@uptownxpress.com to begin your experience today!